With barely two months to go to the start of this nationwide series of events and collaborations, the Fathers’ Charter - an important part of Year of the Dad - is in its final market-testing phase after some important input from stakeholders in recent months. We hope to be ready for the first signatories at our launch at the end of January (so make sure you're signed up to get date and details when they're confirmed). We’re constantly meeting employers, service providers and families who have discovered the win-win of supporting dads as parents - whether that’s increased loyalty in the workplace, services specifically targeted for dads or mums able to make real choices in how they spend their time by partners sharing childcare. There’s a great chance to get involved and find out more about The Fathers’ Charter and what future PR opportunities there are for you by attending our National Stakeholders’ Event, postponed from November 4th to November 25th at 9am – 1pm please RSVP here to book your space. While you’re here on our new website, do have a look around and if you offer father-friendly services, please edit/enter your organisation into our online directory, along with any events you have planned next year – which will also be available to all users of www.yearofthedad.org when we upgrade from the existing holding page to a new bells-and-whistles site in coming weeks. We’re looking to recruit a part time Fathers’ Charter Coordinator. This person will help us develop a network in the private sector – so check out the job advert if that might be you, and help us spread the word! With your help we believe the coming year could mark a shift in the way we think about our roles as mums and dads as new shared parenting legislation brings new opportunities for equality in both home and workplace. Year of the Dad will be about accelerating this culture change. Research overwhelmingly shows how children and families benefit from the positive involvement of fathers– and most fathers we meet jump at the chance to be with their kids when they’re freed from outdated stereotypes and supported to be caregivers as much as crust-earners. Show your support by downloading one of our supporter’s badges for your website or social profile and link to www.yearofthedad.org. Tells us about father-friendly organisations- If you know about organisations who already support dads or you have had great services from such an organisation, get in touch. Or encourage your employer to be involved in the Fathers’ Charter to show their commitment to creating a father friendly world. 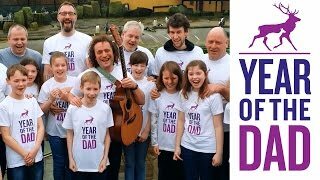 Spread the word - on social media – twitter, Facebook, Google+ and LinkedIn – and use the hashtag #yearofthedad wherever possible. We'll respond as soon as we possibly can, but please bear with us: we’re all flexible workers trying to lead by example with the kind of family-friendly working we’d like to see become the national norm. Inclusivity is very important to us. We have a gender-balanced team and board. We support mums as well as all dads (step-dads, gay dads, adoptive dads, kinship dads and of course grandads!) and prefer to focus less on fathers’ “rights” and more on children’s needs. So let’s broadcast the many brilliant examples of men quietly getting on with being awesome dads - like Pete Airlie - right here in Scotland.